Revives you automatically when your HP reaches 0. Only a small amount of HP is restored. Immune to ice, but stunned by fire. Vexen is fought as a boss in Kingdom Hearts Chain of Memories, Kingdom Hearts Re:Chain of Memories, Kingdom Hearts II Final Mix, and Kingdom Hearts Union χ. First appearing to Riku in hopes of recruiting him to help accomplish his goals, Vexen instead was defeated and obtained valuable combat data he would later use to test Riku and even Sora in the form of the Riku Replica. 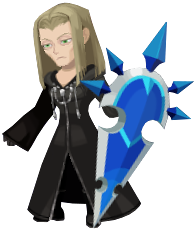 His "product of pure research" dubbed a failure by Marluxia, Vexen later appeared before Sora to prove himself and his strength to his traitorous fellow Nobody. He then craftily lured Sora to the memory-based Twilight Town for a second battle, hoping to ruin the rebellious Marluxia, Axel, and Larxene's plans to take over the Organization at the same time. This attempt led to Vexen's own elimination, however, at Axel's hand, the Nobody appearing to Sora a year after these events transpired as both an Absent Silhouette and a Data Rematch. At the beginning of the battle, Sora should immediately begin to attack Vexen, but take note that he will Guard against all frontal attacks and must be hit from behind. Be careful not to abuse Sleights, as this will rapidly deplete the number of usable cards in Sora's deck, possibly making Vexen's attacks harder or nearly impossible to Card Break. Any Friend Cards should be saved for Sleights or singular usage if they are of high value. It may be wise to equip the Enemy Card Oogie Boogie, Captain Hook, Jafar, or Maleficent cards. Each of these will either make attacking Vexen easier or aid Sora in terms of HP and survival. Sora should also use the Fire Raid sleight by stocking one Fire and two attack cards, boosted by the Red Nocturne card to do heavy damage on Vexen. Should Vexen activate an Attack Card, he will perform a single slash with his Frozen Pride. This can be dodged with simple run or Dodge Roll. If Vexen plays a magic card, he'll shoot a Blizzara spell at Sora. This attack is easily dodged, especially with Dodge Roll. Vexen will also only have access to one Sleight, Freeze. When this sleight is executed, Vexen will attempt to freeze Sora in a block of ice, slowly dealing damage to Sora as he's trapped. 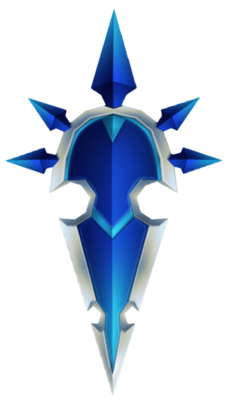 A well-timed run or Dodge Roll can be used to avoid the ice block, but should Sora get captured, he will have to wait for the ice to break. Vexen repeats these tactics throughout the battle, so the same strategies can be used each time. During the second battle with Vexen his HP remains the same, but he now has new sleights to use against Sora. The Blizzara and slash attack will return, as well as the Freeze sleight. The same strategies can be used to avoid them. The same enemy cards used to help Sora win the first battle with Vexen will likely be useful in this battle as well. The first of Vexen's new sleights is Ice Burn. This sleight causes Vexen to create pools of slippery ice on random areas of the battlefield. When Sora steps on them, his speed will be reduced and he will merely trip. Careful maneuvering can be used to avoid the ice pools. Vexen also may use Ice Needles, a sleight that causes icicles to rise from the ground as they follow Sora. These icicles will not stop until they hit or until the Sleight runs its course, so it is best to keep at a constant run to avoid the icicles. He is also able to revive himself once using his Vexen Enemy Card, but this can be avoided by using the Parasite Cage enemy card. The battle against Vexen in Reverse/Rebirth is mostly similar to Sora's second battle, but Vexen has access to a new sleight, Diamond Dust, which creates an ice storm that covers the entire battlefield. It is important to Card Break this sleight in order to avoid it, but overall, Vexen can easily be defeated using Dark Mode's powerful attacks. Vexen is also able to revive himself once using his Vexen Enemy Card, but this can be avoided by using the Parasite Cage enemy card. In comparison to the other bosses Sora has faced thus far, Vexen will be the most difficult to overcome. He has a great amount of HP, and the fact that he blocks all frontal attacks can make landing a perfect combo a difficult task. He also absorbs all Blizzard-attributed attacks, so it is important not to bring any Blizzard cards into the battle. As he has a one fourth chance of casting Blizzard, save all Donald Friend Cards for a Wild Crush sleight. Vexen has a high vulnerability to Fire-attributed attacks, so be sure to equip Sora with a deck that will allow the usage of Fire-based abilities such as Firaga, Firaga Burst, and Mega Flare. Bring a couple high-valued item cards into the battle to restore all used cards to Sora's deck, as well as a few Cure cards for the possible Curaga sleight. Consider bringing the Red Nocturne (if approaching Vexen with a Fire-based deck), Jafar, Oogie Boogie, Maleficent, or Captain Hook enemy cards into the battle, as well. Following a hit-and-run strategy may be the best option win this battle. Vexen may attempt a slashing combo that ends when he causes an icicle to rise from the ground below Sora, which can easily be dodged with Dodge Roll. Sora can Card Break the attack, causing Vexen to lower his Shield, this not only opens him up to more damage but also is one few instances where he can be hit from the front. Attack Vexen when he is either reloading his deck, in a non-offensive setting, or after he is Card Broken. Otherwise, it is best to keep Sora on the move. Vexen may attempt to shoot a homing shard of ice at Sora when he activates a magic card, but with careful timing, Dodge Roll can be used to avoid this attack. Vexen will only have access to two sleights during the battle, both of which can be easily avoided. The first is Freeze, Vexen will attempt to encase Sora in a block of ice so he can rush forward for a slash attack. Dodge Roll or a Card Break is the best way to prevent this attack. Vexen's Ice Needles sleight, however, is a bit trickier to avoid. 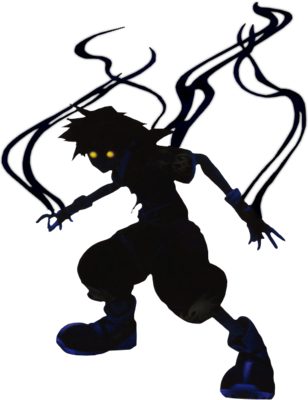 Sora can Card Break the sleight, but if he is out of zero cards or doesn't have a sleight with a higher value, he can either Dodge Roll or keep at a simple run as the icicles chase him. The sleight will either end once it's run its course or after it hits Sora. The battle against Vexen should not be that much of a challenge. Be sure to heal if necessary, use any item cards in Sora's deck to restore used cards, and utilize the special abilities granted by any enemy cards to the fullest. The second battle against Vexen is just as difficult as the first battle. He will use the same attacks and sleights, so the same strategies can be used again to avoid them. Sora also should use the same deck he used during the first battle for the best chance of success, granted more cards can be added if Sora has increased his CP. The only differences in this battle will be Vexen's two new enemy cards, the Air Pirate and Vexen, and a dangerous new sleight. This new sleight, Slide Break, has Vexen elongate his Shield and increase his attack range. He will then attempt to strike Sora twice before slamming the Shield down on the ground, creating an icy shockwave. Either Card Break the attack or chain several Dodge Rolls together to avoid it. While the Air Pirate enemy card will prevent Sora from Card Breaking Vexen's item cards. The battle against Vexen in Re:Chain of Memories is identical to the battle in the original Chain of Memories. 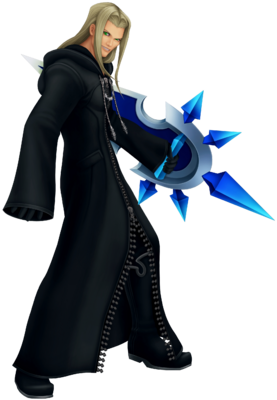 Blizzard (ice) Vexen slashes at Sora or Riku with the Frozen Pride, an icicle rising from below to damage them at the combo's end. In Chain of Memories, Vexen simply attacks Sora or Riku without causing an icicle to rise. Blizzara (ブリザラ, Burizara?) x1.0 Blizzard Vexen sends a homing ice shard at Sora or Riku. Elixir (エリックサー, Erikkusā?) — — Reloads all attack and magic cards. Mega-Ether (メガエーテル, Mega Ēteru?) — — Quickly reloads magic cards with no charge time and resets the reload counter. Even normally unreloadable cards are restored. Slide Break (スライドブレイク, Suraido Bureiku? )[KH Re:CoM] x2.0 Blizzard Vexen elongates the bottom of the Frozen Pride, transforming it into a monstrous ice blade. He then slashes Sora with the empowered weapon numerous times before performing a downward slam, thus shattering the ice blade and reverting his Shield to normal.